A monument to encourage world peace has been unveiled in Scholes in a ceremony attended by MP Alec Shelbrooke. The village Peace Flame was designed and constructed by Roger Mawson and Glyn Davies as part of an international movement to encourage peace and declared lit at the opening also attended by Scouts, schoolchildren and The Royal British Legion. A spokesman said: “The Peace Flame in Scholes is a way for all of us to nurture the future of peace for our children and grandchildren. “There is an educational project that sits alongside the flame and the children in the primary school have been writing their ideas of peace on labels. The Scholes monument, which was steered by a working group of vilagers throughout 2018, is the second World Peace Flame in England and will be lit 24-hours to remind people of the potential to bring peace into lives. “It is a beautiful addition to the village, situated in the Peace Garden on Main Street opposite Saint Phillips Church,” added the spokesman. 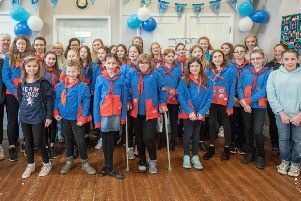 Future fundraising events are being organised for next year, including a coffee morning on Saturday February 2 at Scholes Methodist Church, 10am-noon. And there will be a Scholes Flame Dance Saturday February 16 at Scholes Village Hall 7.30pm. Tickets will be on sale soon. Other events include a Peace Party to be arranged for July 2019 and on September 21 there will be a celebration of the United Nations’ (UN) International Day of Peace to recognize the efforts of those who have worked hard to end conflict and promote peace.